Best and Worst of Management in the Kingdom! | don't bite the apple…work is not a fairy tale! ← Preventing Workplace Violence in the Kingdom! Best and Worst of Management in the Kingdom! I’ve been glued to the Olympics this week. I can’t get enough of the clothes and the stories of motivation. I was determined to write this amazing Olympic article and then never did it because I was busy watching. Then while out and about in the Kingdom I stumbled across the best and worst case scenarios of motivating employees. 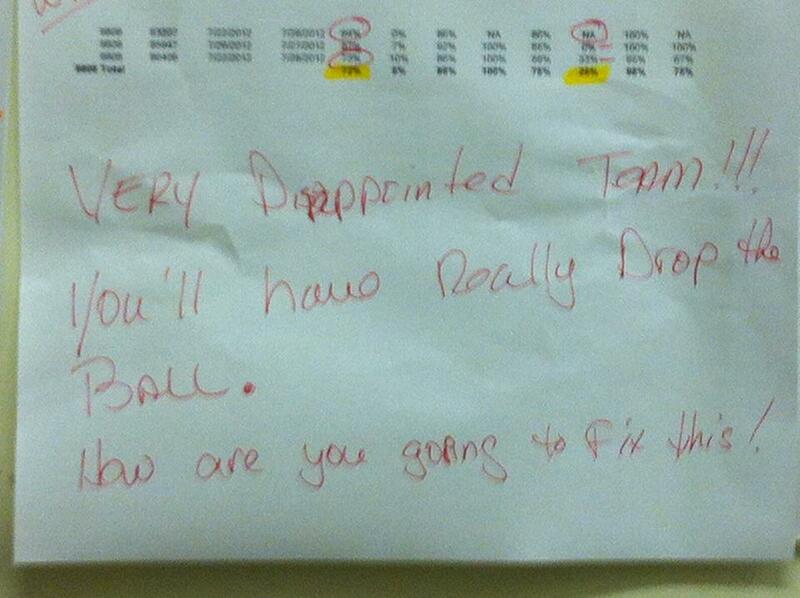 are you going to fix this!” Let me say again, THIS WAS WRITTEN BY THE MANAGER AND POSTED ON THE BATHROOM DOOR! ( My husband walked back to see what’s taking so long and almost dies as he sees me taking a picture of the memo. I couldn’t help myself.) So instead of a meeting and a plan, these employees were scolded and given a sarcastic statement on fixing the problem. How does the manager blame his team? And, if they are so bad shouldn’t the manager come up with his own plan to fix the numbers? If I’m working at this place for a little over minimum wage, I am not going to care about making this manager successful when I look at this every time I walk in the back room. It would do the opposite of motivate me. Then we went on to our next destination, Wrigley Field Season Ticket Holder Appreciation Day. We were given tickets and I think I was more excited than anyone in my family. After walking in to the clean park, on a day all these people would regularly be off, we were greeted with huge smiles and asked to have a seat because Mr. Ricketts wanted to speak with us. He thanked everyone for their support of the team and then introduced the Management Team. He explained that they would be around to answer any questions we had about their part of the team. Amazing Customer Service I thought. Then he and the Department heads introduced their staff. They said their names, what they did at the park, what they enjoyed in their personal life and why they were great. For some it was the music they liked, some it was family (and they mentioned people by name) and for some it was where they went to school. They had all of us clap for each person. Did we care that Sarah scrapbooked? No, but Sarah cared that her manager and Mr. Ricketts paid enough attention to her that they mentioned it, you could see that in each employee’s smile. Later in the park, they were around answering questions about the grounds and taking suggestions on other issues. This year the tickets were of old baseball cards and in the beginning of the year a season ticket holder asked about getting copies because the tickets were so great. Someone in the ticket department took that to marketing and they gave out posters with pictures of those tickets. People were thrilled and the ticket person was so happy that marketing got it done. It showed that the organization listened to both it’s customers and the employees. It showed they valued each other and their suggestions. If only we could get to the World Series, but that’s another blog. What was different with the two styles? Discussion vs. written accusation, blame vs. team approach. I’m sure there are issues within the Cubs, you can always find a disgruntled employee. But you can tell by an environment how it’s employees are treated overall. “The best bosses are empathetic and fully aware of how their decisions and the decisions of upper management affect their employees” –Sebastian Bailey, President of the Mind Gym, Inc. The retail store manager was clearly void of empathy or personal responsibility, which will trickle down to the staff. I guarantee those numbers will not get better. The Cub management team was ready to take responsibility for everything from field maintenance to team selection. Some of those discussions wouldn’t be pretty, but they stood front and center. It showed the character of the executive team and that trickles down too. What is your style and how is it affecting your employees? Good or bad, you should evaluate this at every level. I started researching and found the amount of information on bad bosses was staggering. There are several websites on bad bosses and a movie about them, so many examples of why I’m in HR. I have been called by countless employees and bosses that I could come up with my own website detailing the horrible managers. Unfortunately, I could have equal stories about employees. Sometimes managers are just jaded. But that is no excuse for treating employees badly or giving up. “39% of 595 employees were “very satisfied” with their relationship to an immediate supervisor. Employees responding to a Society for Human Resource Management survey rated these relationships among the top five factors most important to their job satisfaction” –SHRM That leaves 61% unsatisfied. Where are you in that breakdown? Look around. It’s easy to tell the worst boss story. Tell me your BEST boss story! This entry was posted in Motivation and tagged Business, Company, customer service, employee turnover, employees, human resources, management, Senior management, Work. Bookmark the permalink.